Dental health is probably the most neglected of all health maintenance items. It is important to have your pet's teeth examined on a routine basis. If left unchecked, bacteria from the mouth can enter the bloodstream and travel to the lungs, heart, kidneys, liver & even the brain, starting infections there and seriously compromising the health of your pet. Almost all dental disease can be prevented with proper management. We recommend brushing your pet's teeth with CET toothpaste; daily is best. If brushing is not possible, try using an oral hygiene rinse, gel or chew. Dental disease can affect our dogs and cats at any stage of life, but it is most common as our pets enter middle age. Studies at the Veterinary Colleges of Ohio State and Cornell University have found that 85% of dogs and cats over 6 years old have some form of dental disease. Dental disease can be put into three categories: gingivitis, tartar and pyorrhea. Gingivitis is inflammation of the gums. 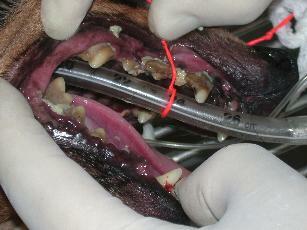 You can easily see this by the increase in pinkness of your pet's gums, especially at the gum line. Tartar is the accumulation of plaque on the teeth, usually starting at the gum line in conjunction with gingivitis. Pyorrhea is the most serious of the three conditions. It is pus in the mouth, usually between teeth and gums. All three of these conditions require treatment. Therapy can range from antibiotics to anesthesia with a complete dental scaling and polishing. The appropriate type of treatment is decided upon after an oral examination. These conditions need to be treated because they are actual infections. These conditions are caused by one of two reasons. The first reason is feeding canned or soft foods. These foods give little to no benefits to the teeth and gums because they require little to no chewing. The second reason is genetics. As with our teeth, some people develope cavities or excessive tartar more easily then others. It is the same with some animals having more dental problems than others due to genetics. Since we cannot change genetics, brushing your pets' teeth is the best prevention of dental disease. Any of our staff can give you instructions on training your pet to have its teeth brushed. Another option is mouthwash, which can be squirted into the dog's mouth. An additive is also available to put in your pets' water. Dry food and hard biscuits are our other recommendations. Prevention is always the best medicine. However, if your pet experiences dental problems we can help. Our dental services include teeth cleaning and polishing, dental x-rays, tooth extractions and oral surgery. Our doctors have received extra training in dental procedures to assure that your pet receives the best possible care. So the next time you complain of bad dog breath or cat breath, look into your pet's mouth and then call us for an examination. Let's cure any problems and prevent more serious ones before they start.